There seems to be a conspiracy out there….and many bloggers are guilty of being a part of it. We just can’t seem to help ourselves. Our favorite craft stores and online home decor sites are some of the biggest perpetrators. We enter their doorways and stand aghast with mouths hanging open and eyes bugging. We feel disoriented and out of sorts. Or we click over to our favorite online stores only to find they too are helping to spread this far and wide. It’s truly becoming an epidemic..and I might be one of the worst offenders! It’s Seasonal Sabotage Disorder! You are probably all too familiar with it! It’s 90 degrees and you enter your favorite craft store and there it is. All of the Fall Decor neatly lined up row after row with sweet little elves…I mean employees…running around with buckets of Christmas ribbon and ornaments deciding where best to promote the newest line in Holiday Decor! 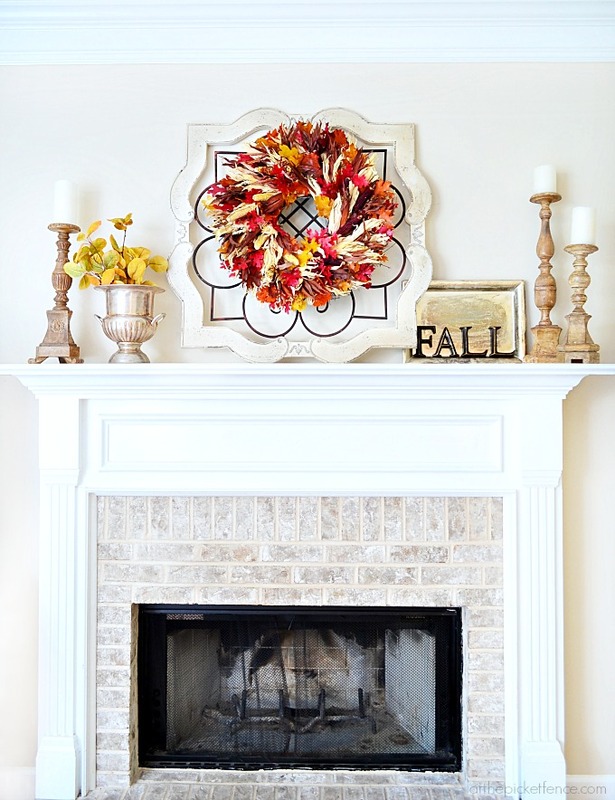 Or, maybe your visiting your favorite blogger..ahem…,before you head out to the pool, and she has a post up featuring fall mantel ideas featuring a gorgeous Balsam Hill Fall Wreath in all it’s fallish glory! And your mind’s starts whirling and you think, “I’m not ready for FALL!” I still have the AC running and the ice cream truck is still stopping on my corner. But then you hesitate….taking in all of the gorgeous fall colors and the vintage silver tray from The Goodwill with the word FALL spelled out on it and you start to get that little tingly feeling. You know like the Grinch had when his heart grew 10 times that day! You start thinking about how you might decorate your fall mantel or your front porch. 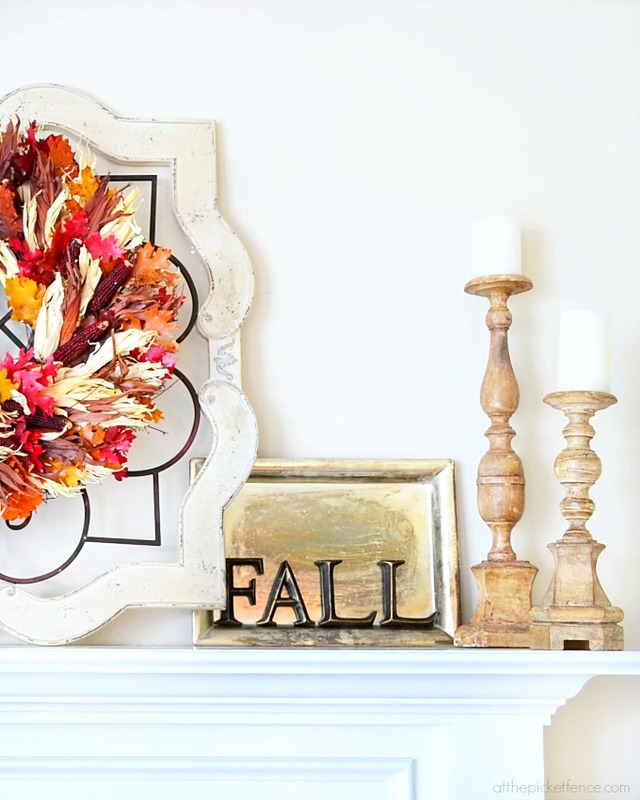 You start looking for ideas to transition your summer mantel into fall. Nothing to dramatic yet, it is still August after all. Maybe some pretty fall leaves in a vintage silver trophy cup. Some tall wooden candles that add warmth. Maybe you start wondering how you could get your hands on a pretty fall wreath. One that has just the right mix of fallish colors with tiny corn cobs and corn husks. And maybe, just maybe you might let your mind wander all the way to December. You start imagining evergreen and white lights and how pretty a winter garden wreath, festooned with cream berries and green pears would look hanging on your front door. Or maybe you are a traditionalist and would love a classic holiday fields wreath with preserved eucalyptus leaves, pinecones and touches of red and green! Then there are those of you who love the simplicity of a Balsam Fir lit wreath or garland! That’s when you’ll know you have it too! Seasonal Sabotage Disorder! Ready for the cure…just give into it! Embrace these next seasons with open arms…and I’m going to help you! Balsam Hill is offering ONE At The Picket Fence reader a wreath OR garland of their choice!! And so that everyone can have a chance to own one of Balsam Hill‘s amazing wreaths, garlands or trees here’s a coupon code for 10% off anything on the website! and when the symptoms of Seasonal Sabotage Disorder set in….you can thank me! grin! I was provided a Balsam Hill wreath to review..all opinions and the term “Seasonal Sabotage Disorder” are my own! 95 Comments on "Transitional Fall Mantel Ideas"
Fall is my favorite! Love the Autumn harvest wreath among many other ones that Balsam Hill offers. Ooohh! That fall mantel made my heart go pitter patter! I don’t have a mantel but I do have a metal flourish hanging above my living room mirror. It would look so cute with a small wreath embellishing it! Agreed! I am so excited for fall and all of these colors are making me crazy for some crisp air and baked goods 🙂 I love the fall harvest wreath! This is gorgeous!!!! I love the colors and the frame is such a neat twist! The fall wreath is my favorite!! This is gorgeous!!!! I love the colors and the frame is such a neat twist! THis is beautiful! I am loving the how the colors of the wreath pop against the white mantel. So pretty 🙂 I would love a fall wreath of any sort, we have 7 exterior doors! I would love to mix it up a bit on each part of the house. Love this wreath! I am SO ready for fall! I visited my favorite local gift shop the other day and walked into a fall fantasyland. I felt like a kid in a candy store! Can’t wait for September 1 to roll around … I figure that’s a respectable time to start bringing out my fall decor. P.S. I noticed Hobby Lobby has their Christmas trees on sale already! Fall is my favorite season for decorating. I love this wreath. Love this!! Sure would look good hanging on my door! Whay a beautiful wreath! It would look great at my house! I have so been looking a mantle ideas…thanks for this beauty. I have two mantles in my house, so I need all the help I can get! Have a great day! Fall is such a cozy time – who can resist? Your mantel is warm and cozy – well done!! 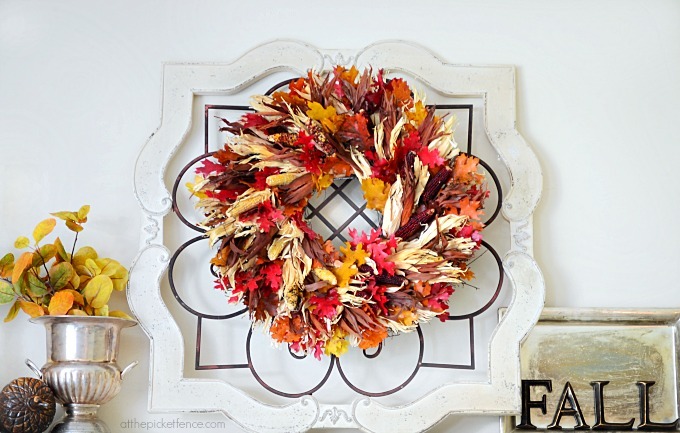 Fall is definitely my favorite season and I love the fall wreath! Hey Heather I adore your mantel! I think we all suffer with some degree of that nasty disorder. ha! Your wreath is perfect and of course I think the vintage touches are perfect. I have long admired the Balsam Hill products and would love to win a garland. Thank you, thank you for this giveaway! Autumn Harvest Wreath is my fave for holiday decorating, but I’m loving the look of the Sweet Rose & Berry quite a lot! I love fall, and the mountain meadow wreath is so pretty! Fall decor is my absolute favorite, especially since it goes so well with the color scheme in our home……love, love, love! This wreath would be perfect any where in our home! 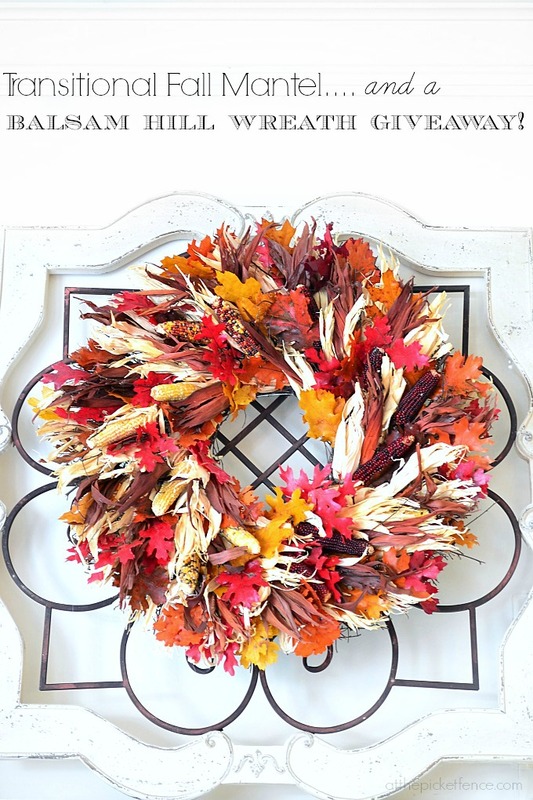 I LOVE fall, and love the style of the Cranbrook Orchard Wreath! I would love the fall wreath featured or a Christmas one, but fall is my fav time of year. Thanks for the giveaway! I love it….”Seasonal Sabotage Disorder”….Beautiful mantel Vanessa! The wreath is gorgeous! Balsam Hill…a great company…and love their Regency Gate wreath!…Great giveaway! 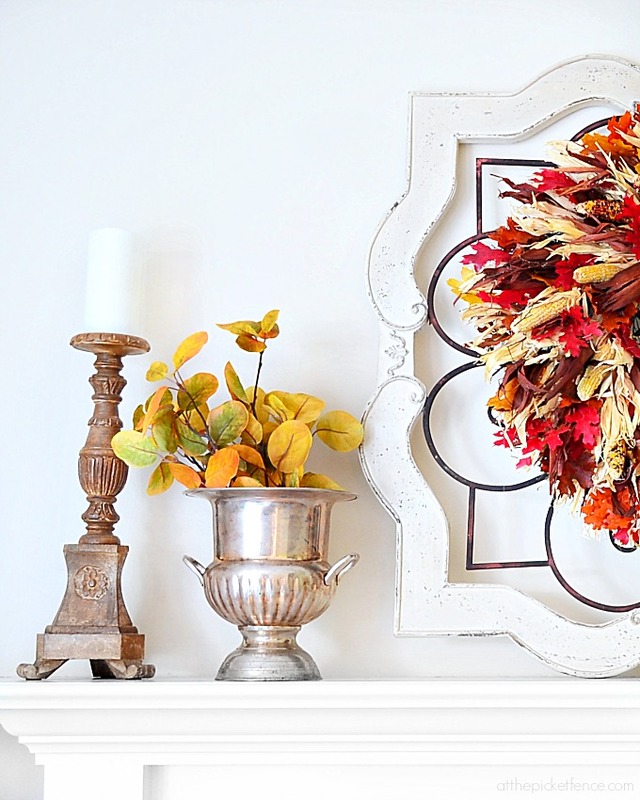 That wreath is beautiful … love your fall mantel. I think the minute the calendar hits September it’s time to break out all the fall stuff! You’re on a roll, Darling! What a cute post and a most gorgeous wreath! I’m not quite ready for fall yet but I’d poke that wreath up as quick as a flash if I had it. Oh, and I think I’d choose the Mountain Meadow garland! Fall is my favorite! And as it feels a bit “fallish” already with cool nights and low humidity, I believe this is perfect timing! I wantthis wreath!! So beautiful!! I am torn I love Fall and I love Winter seasons. The wreath that has caught my eye is the Holiday Gala Christmas Wreath. I love the mountain meadow wreath for Christmas! 🙂 I love the fall wreath you have there too!! Fall has always been my favorite season!! That wreath is gorgeous and I love how you grouped it with the tarnished silver. So beautiful! I love Balsam Hill’s products! Fall is by far my fav time of the year. Lot’s of family birthdays, fall festivals and my favorite holiday-Thanksgiving! Saboteur! And you know that those who love autumn the best have a hard time holding back on the decor. naughty naughty girl. Autumn is definitely my fave time of year. I love their lavender wreaths. Love that wreath:) thanks for the chance to win. So many choices at Balsam Hill!! I love the rusts and oranges of the fall season. Thanks for featuring this vendor. I love the idea of a transitional decorating time! It’s so true – we see the inspiration and may or may not want to jump right on it – thanks for sharing tips on how to dip our decorating toes into the coming season! And that wreath is lovely!!! Can’t wait to see more from Balsam Hill!! I love Spring but I don’t have much for Fall decorations. That Fall wreath would be perfect for my new mantel. Fall is my favorite time to decorate, there is something about the warm colors and the fresh fall air that is so cozy. The wreath shown is gorgeous! I love to decorate for Christmas and I love their traditional fir wreath. It’s so versatile! It’s so hard, isn’t it?? We can’t wait to post these great decorating ideas until it’s too late but right now I want to jump in the pool! I LOVE the Balsam Hill Winter Garden wreath. Love. Thanks for the great giveaway and the fab Fall inspiration! 83 today, 84 tomorrow, here in Ohio, but my fall flowers are set to bloom, and my husband dismantled his cucumber patch yesterday. So planning a fall mantel is accepted at my house and yours is lovely. I’m on the search for a silver trophy cup! Now that I retired, fall is my favorite season, and the wreath would look great in my kitchen. I love your fall wreath, and the Mountain Meadow wreath on line. The wreath is beautiful and so is your mantel! I’m almost ready for my favorite season of fall to come, though I’m hanging on tightly to the last lazy days of summer! Thanks for the chance to win a beautiful prize!